Kids are often tough to please – but they’ll be grinning from ear to ear whenever they’re in The Mile High City, thanks to Denver’s wide array of kid-friendly attractions. Interactive museums, incredible zoos and aquariums, wide open parks – they’re all guaranteed to please even the grouchiest young ones. Writer (and mom) Lori Midson gives you the lowdown on some of her favorites. City Park is expansive greenway boasting tennis courts, picnicking areas, playgrounds, lakes for paddling and a spectacular summer concert series. At the eastern edge of the park sits the Denver Zoo, where education comes alive. More than 4,300 animals await at Denver&apos;s most popular cultural attraction. See elephants swim, orangutans swing and hear lions roar while enjoying up-close animal experiences that provide moving connections to wildlife. Just adjacent to the zoo is the Denver Museum of Nature & Science, a spectacular museum that explores fossils and dinosaurs, the mysteries of space at Gates Planetarium, Egyptian mummies, larger-than life films at the Phipps IMAX 3D Theater, and a slew of interactive exhibits. The Discovery Zone has dozens of hands-on activities for kids of all ages, from archeological sand pits to moving water features. The Platte River Valley, in the heart of the city and on the west side of downtown, boasts a cornucopia of family-friendly attractions and entertainments. Confluence Park is one of the most frequented downtown parks and home to the South Platte River&apos;s premiere kayak chutes. The kids will experience quite a rush watching adventure seekers brave the rushing waters. If there aren&apos;t any kayakers, don&apos;t worry; it&apos;s still worth the trip for the great views of downtown and an extensive walking and biking trail. At the Children&apos;s Museum of Denver at Marsico Campus they believe in kid-powered learning. Their one-of-a-kind exhibits open doors for young minds to create, discover and explore — on their own terms. Whether painting or sculpting, pretending to be a foraging squirrel, climbing to the top of their 3 ½-story "mountain" or making 8-foot-tall bubbles, an adventure is ready for you. On the first Tuesday of every month, families can play for free from 4 to 8 p. m.
Nearby, Elitch Gardens Theme & Water Park offers exhilarating adventures on 53 rides, including the new 17-story Star Flyer swing. There is also an area perfect for young kiddos, plenty of family rides and a 10-acre swimming area with slippery slides, crashing waves and lazy rivers. Just a short walk away is the Downtown Aquarium, a seaworthy spectacle of kaleidoscopic fish coupled with reptile, bird and tiger habitats. Here, amid the astounding marine life, kids can feed the stingrays, swim with the sharks, pan for gold, see a mermaid show, become a marine biologist for a day or even spend the night in the aquarium. While you&apos;re in the area, hop aboard the Denver Trolley, an open-air streetcar that resembles the trolley on the Mister Rogers&apos; Neighborhood TV show. 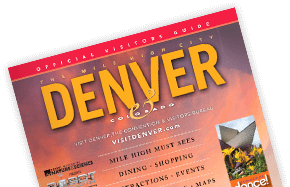 The narrated tours provide a fascinating historical account of Denver from its Gold Rush days to the present. Located in historic Denver Fire Station No. 1, families will love the Denver Firefighters Museum. The building was erected in 1909 and served as a working fire station until 1974. The kids will enjoy the hands-on activities as well as the exhibits that provide information on fire safety and prevention. Be sure to have the camera ready as they try on equipment, slide down the pole, ride on a fire truck designed specifically for kids and pretend to put out fires. The museum also has a gift shop with toys, apparel, books and more. Now that the kids are telling you they want to be fire fighters when they grow up, it&apos;s time to head for the next destination. The History Colorado Center brings history to life with amazing interactive presentations. Traverse a 60-foot map of the state using a "time machine." Virtually zoom across the plains in a Model T Ford. And soar off of a re-creation of one of the world&apos;s first ski jumps in Steamboat Springs, Colo.
At the Wings Over the Rockies Air & Space Museum, more than 50 planes and riveting space-oriented displays occupy the sprawling space, an aviation wonderland that allows families to get up close and personal with giant bombers, fighter jets, antique planes and a Vietnam-era Huey helicopter. The museum always has seasonal exhibits, and on the second Saturday of each month, kids can experience the electrifying buzz of climbing into the planes&apos; cockpits. At Dinosaur Ridge in Morrison (near Red Rocks Park & Amphitheatre), an outdoor museum and visitor center, you can touch the bones of Allosaurus and Stegosaurus at the site where important dinosaur discoveries were made in the late 1800s. See how Iguanadons walked by viewing real dinosaur footprints preserved in the sandstone. There&apos;s a free, self-guided tour. Get a glimpse of early dinosaur discoveries from Colorado, including fossils from the first Stegosaurus and Apatosaurus ever found. Located 25 minutes west of Downtown Denver, the 3,000-square-foot Morrison Natural History Museum offers a relaxed environment that is perfect for kids of all ages to explore rocks and fossils. The exhibits and guides connect visitors with the ancient story of the Front Range. Local excavations yielded famous baby dinosaur footprints that were featured in Smithsonian magazine and worldwide press. Located in Westminster, a 15-minute drive from downtown Denver, the Butterfly Pavilion is the perfect indoor refuge in which to interact with live invertebrates fluttering around a lush rainforest, or to hold Rosie, a Chilean Rose Hair tarantula, in the palm of your hand — if you dare. The tropical conservatory is filled with lush greenery, trickling streams and more than 1,600 flitting butterflies, moths and skippers, shipped from farms as far away as Kenya and Ecuador. Also stop by the Water&apos;s Edge exhibit to be immersed in an underwater world full of sea creatures. Learn about climate change, the 21st century&apos;s hottest topic, at the fascinating National Center for Atmospheric Research. See a hailstone the size of a softball, watch as a miniature tornado is whipped up in front of your eyes, and get an up close look at how lightning is created. Free public tours are available. There&apos;s no shortage of fun-filled, free — and nearly free — family activities in Denver. Ollies, grinders and rail slides are just a few of the moves you and the kids can take in at the 50,000-square-foot Denver Skatepark. Always packed with skaters, you&apos;ll see novices and experts alike attack the urban environment of planters, curbs, rails, bowls, half-pipes and more. To see where your currency is conceived (sorry, no free handouts), follow the money trail to the Denver U.S. Mint. The free, 45-minute tours are led by knowledgeable guides and provide a fascinating look into the history of coinage. Both kids and adults will love getting up close and personal with the shiny pocket change that streams off the production lines. Tours are available Mon.–Thurs. from 8 a.m. to 3:30 p.m. Same-day tour tickets are available at the Tour Information window, which opens at 7 a.m.; no advance tickets are available. Line up early. Aside from being a geological wonder 70 million years in the making, Red Rocks Park & Amphitheatre is one of the world&apos;s most famous concert sites and a must see for any music enthusiast. Kids love exploring the trails surrounding the concert venue, and a spectacular view of the plains makes it a perfect place for a kid-friendly hike. Anyone with even the smallest sweet tooth will love this free tour, which gets you behind the scenes at Hammond&apos;s Candies, a company that has been making candy in Denver since 1920. You&apos;ll come away with a newfound respect for the candy industry, plenty of free samples — and maybe a cavity or two. The Tattered Cover Book Store, arguably the top independent bookseller in the country, hosts hundreds of free children&apos;s events throughout the year, including lectures, book release parties and author appearances. The 16th Street Mall location is one of its three locations in the metro area, plus one at the Denver International Airport. The 165-acre park is one of Denver&apos;s largest and consistently voted by locals as their favorite. Washington Park&apos;s expansive lawns, manicured gardens and Smith Lake highlight the park with several trails, including one that goes around the perimeter of the park. This is an ideal setting for a family picnic, tossing the Frisbee around or just hanging out in the sunshine. Denver is an undisputed sports paradise, and while tickets to the major sporting events don&apos;t come cheap, in-the-know baseball fanatics purchase Colorado Rockies baseball Rockpile seats, which start at just $4. The world-class Denver Art Museum — free for those 18 and younger every day and free for all the first Saturday of each month — is a great place to introduce kids to the wide and wonderful world of art. Every gallery on every floor of this expansive museum has something fun for families. First, stop by the new family space on level three of the Hamilton Building for activities inspired by the exhibition Stampede: Animals in Art. Then pick up Gallery Games —small activity boards that help kids learn about artwork through games similar to I spy, bingo and memory matching — which you&apos;ll find in various galleries and exhibits throughout the museum. Smudge, squiggle and splatter at Create Playdates on the second Wednesday of the month from 10 a.m. to 1 p.m. (extended to 2 p.m. June–August). Drop in with your little ones (ages 3–5) to meet up with other tots and their grown-ups for artmaking, storytime throughout the museum and instructor-guided "close looking" to explore artwork. Create Playdates explore a new theme every other month and are available in English and Spanish. Got some little detectives? They&apos;ll love Foxy and Shmoxy: Art Detectives, held the second Sunday of each month from September to May. DAM also offers a wide array of art-centric classes and camps for kids every spring break, fall break, Thanksgiving break, winter break and throughout the summer. Contemporary art can be for kids, too! The Bubble Garden at the Museum of Contemporary Art Denver is a dedicated, artist-designed space for kids and families that engages families in creative and imaginative ways. This space provides opportunities for families to be together and play, and is a destination inside the museum. MCA Denver is free for all kids and teens 18 and younger.